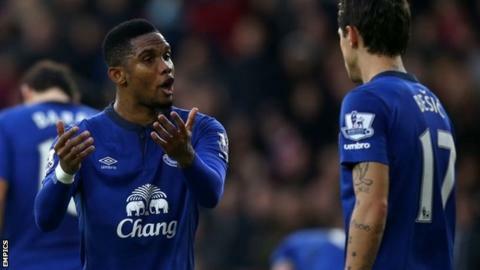 Everton boss Roberto Martinez says Samuel Eto'o is not on the verge of leaving the club for Sampdoria. The Serie A side had said they hoped to sign the 33-year-old former Cameroon striker this week. But Martinez said: "The Samuel Eto'o situation is something that we're going to make sure that the next two weeks is a period of reflection and see what's the next move in that respect." He does not expect major changes to his squad this month, bar Eto'o. The veteran joined the Toffees on a two-year deal in August, and has scored four goals in 20 appearances. "Eto'o should be here in Genoa on Tuesday," sporting director Carlo Osti told Italian broadcaster Telenord on Monday. Sinisa Mihajlovic's side are chasing a Champions League spot, behind third-placed Napoli on goal difference. Eto'o was left out of the Everton team to face West Ham in the FA Cup last week after interest from clubs including Sampdoria. He is keen to be closer to his family, who live in Milan. He began his career at Real Madrid but made his name at their arch-rivals Barcelona. Eto'o moved to Inter Milan in 2009 as part of Zlatan Ibrahimovic's switch to Barcelona and went on to win the Champions League again in his first season under Mourinho at the San Siro. The four-time African Footballer of the Year scored 12 goals in 35 appearances for Chelsea last season after signing a one-year deal from Russian outfit Anzhi Makhachkala. Can Watson fulfil potential at Australian Open? Read more on Can Watson fulfil potential at Australian Open?